NEW YORK – Floyd Mayweather’s map to superstardom and unprecedented wealth for a professional athlete was all Deontay Wilder needed. Wilder didn’t predict Tuesday that he’ll eclipse Mayweather’s earnings. The WBC heavyweight champion’s point was that his adviser, Al Haymon, and Showtime’s Stephen Espinoza have a track record of building a superstar among American boxing fans. Wilder still seriously considered attractive offers from DAZN’s John Skipper and Bob Arum’s Top Rank/ESPN. Ultimately, Wilder (40-0-1, 39 KOs) became convinced that working with the same team that helped make Mayweather a household name could do the something similar for a huge heavyweight champion that has knocked out almost every opponent he has faced. 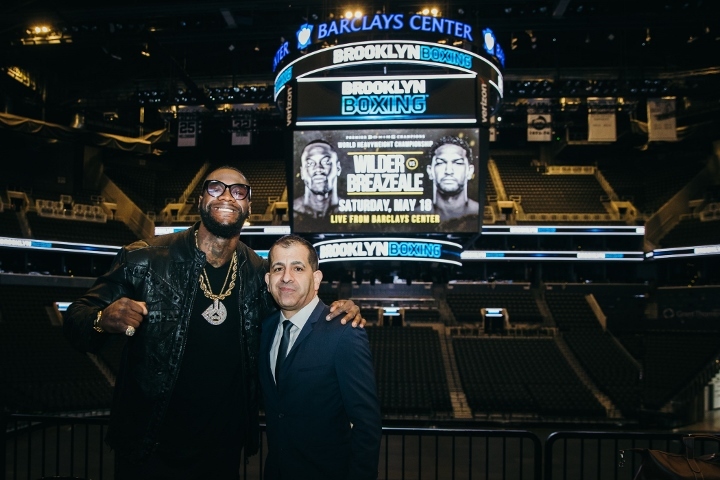 The Tuscaloosa, Alabama, native announced during a press conference Tuesday that Showtime will televise his May 18 fight against Dominic Breazeale (20-1, 18 KOs) from Barclays Center in Brooklyn, also where the press conference was held. Before that unforeseen announcement, it was commonly believed that the mandated Wilder-Breazeale bout would be distributed on pay-per-view by FOX or Showtime. “You’ve gotta look at Floyd – he’s a small fighter,” Wilder told a group of reporters following the press conference. “And if you were able to do what he did, being a small fighter, like I said, people don’t wanna sit around for 12 rounds now. I done been to many a fights and seen people get antsy, and a lot of people can’t wait till it just be over, just like this. You know what I mean? They don’t wanna see 12-round fights, but they’ll pay for it because of their love and passion for boxing. According to numerous estimates, the undefeated Mayweather made in excess of $700 million during a 21-year pro career in which he won world titles in five divisions. The welterweight champion signed a six-fight contract with Showtime in February 2013 that helped him earn a minimum of $30 million per fight. That deal included lucrative pay-per-view fights against Canelo Alvarez and Manny Pacquiao. Wilder believes a rematch with Tyson Fury (27-0-1, 19 KOs) and an ever-elusive showdown with fellow champion Anthony Joshua (22-0, 21 KOs) can earn him more than he was offered as part of the DAZN deal presented to him recently by Skipper. I am sure he was speaking of JetBlue or another airliner at the time he said that. [QUOTE=Sweet_Science2;19682598]I already bodied you. Checkmate [email protected][/QUOTE] Floyd Mayweather had to wait for Oscar de la hoya to sign his checks!! FLOYD MAYWEATHER deposited GOLDENBOY PROMOTION CHECKS!! FLOYD NEEDED OSCAR!!! GAMEOVER CHECKMATE!!!! BAHAHAHA!!! [QUOTE=Sweet_Science2;19682598]I already bodied you. Checkmate [email protected][/QUOTE] GAME OVER YOU LOSE!!!! FACTS dont care about your feelings! !